I had the pleasure of watching one of the biggest modular homes Cardinal Homes has ever built being set in northern VA this week. 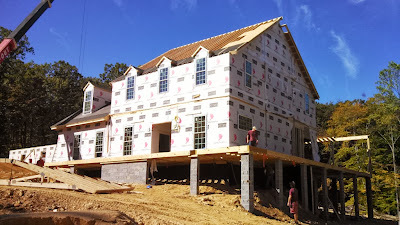 The 5,782 sq ft custom home came in 18 modules and was set in two days! Add the 1,500 sq ft of porch area and full 10’ high basement and you’ve got one big house. The main house is 3 boxes deep and 2 high with a small bump out module in the front. The large garage was also panelized by Cardinal Homes. This was a William Poole designed home and the first modular for the General Contractor, Paul Reimers, owner of PR Construction in VA.
Cardinal began operations in 1970 and was purchased by the Berneche family in 1992. It is a high quality, flexible operation capable of producing virtually any product -- residential or commercial. It serves the mid-Atlantic and the Deep South. Cardinal entered into an agreement with Chip Lofton in June to sell a controlling interest and he is now managing everyday operations. For more information, contact Dan Hobbs at Cardinal Homes.